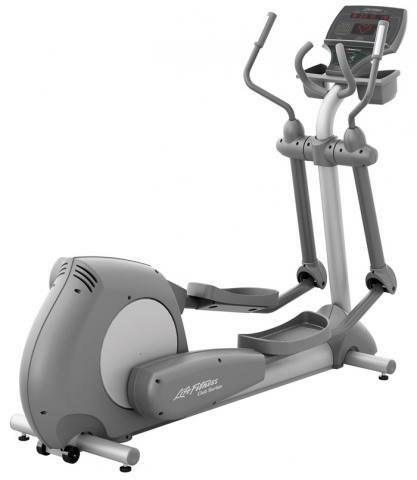 Life Fitness Integrity Series Elliptical Cross-Trainer (CLSXH) is built for total comfort. It is a proven machine that offers a variety of low-impact workouts. It is engineered to be ergonomically correct. It has that kind of durability that only Life Fitness can provide. Life Fitness Integrity Series Elliptical Cross-Trainer (CLSXH) has the latest aesthetic and entertainment upgrades. This Integrity Series cardio products now offer an even more compelling user experience. Lifepulse™ digital heart rate monitoring hand sensors are conveniently placed on the ergonomically designed handlebars and bullhorns to provide precise heart rate monitoring, and Polar® telemetry provides accurate, “hands free” heart rate monitoring. (Telemetry requires optional chest strap). Proven Stride technology produces a unique, popular motion with 20″ stride length, research-based ellipse path and biomechanically correct moving arms. ToughTrain 3.0 out of 5 Though have strong frame and latest features, yet it is too costly. Its all your choice. *Note: Most of the sites, stores or shopping portals listed above sell Life Fitness Integrity Series Elliptical Cross-Trainer (CLSXH) with discounts and other exciting offers. There is a possibility that the some of above websites are not selling Life Fitness Integrity Series Elliptical Cross-Trainer (CLSXH) now. Toughtrain.com is not liable for such cases or instances. Also we do not recommend any seller for Life Fitness Integrity Series Elliptical Cross-Trainer (CLSXH) and a buyer should buy from where he/she gets best deal with quality of products, service and on time delivery (shipment).